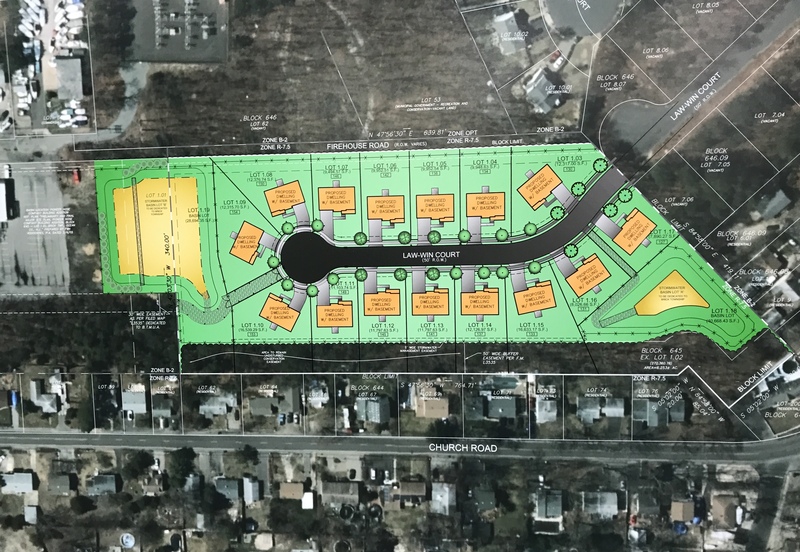 A proposal to construct a 15-home development on a plot of land once owned by the Pioneer Hose Fire Company won final approval Wednesday night at a meeting of the township’s planning board. The 6.2-acre plot, which was granted preliminary approval for subdivisions in July, will be developed by Arya Properties, a builder based in Island Heights. Over the last several months, Arya fine-tuned its plans to build the development and presented them to the board at its meeting. Wednesday night’s hearing mainly focused on concerns over drainage in the development, which will be constructed at the property off Drum Point Road and beside Law-Win Court. “Two retention ponds will be dedicated to the township and there are a series of easements that connect the two basins,” said attorney John Paul Doyle, who represented the applicant. Doyle said the developer has addressed easements that will allow the township to access drains as well as easements for utilities and other stormwater management features. Storm drains will be installed in the backyards of the homes to prevent flooding. The property was donated to the fire company decades ago by a neighboring family whose descendants now live in Cocoa Beach, Fla. Members of the family appeared at the July preliminary hearing in opposition to the plan, saying it was their relatives’ wishes that it be used by the fire company or preserved. Doyle said the property was offered to the township and Ocean County prior to the developer and both declined. No one opposed the plan at Wednesday night’s meeting, nor was anyone from the fire company there to speak on behalf of its approval, as in July. The property is located within the confines of the township’s R7.5 zone, which allows single family homes with 7,500 square foot lots.